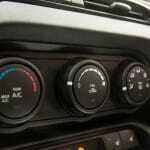 It’s a great time to be an auto enthusiast. The beautiful part about this discovery is that there’s something out there for just about everybody. 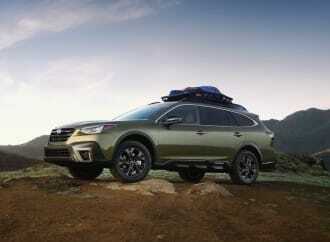 Whether you’re into big horsepower, fuel efficiency, maximum utility, or raw driving feel, there’s something on the market for you, and it almost doesn’t matter where in the world it comes from. 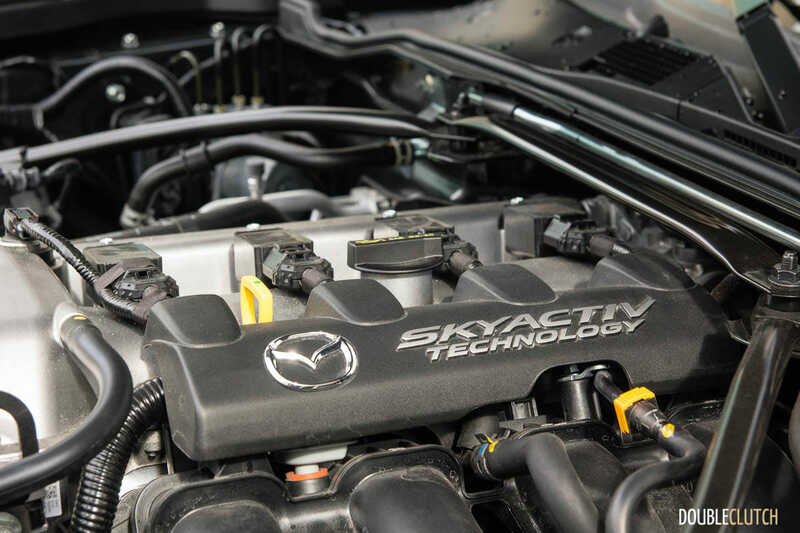 As far as horsepower goes, when you’re finding midsize family sedans reaching the 300hp mark, it’s easy to see how tight competition and how advanced the engineering is these days. When modern cars can put this much power to the wheels, all while still managing to return very reasonable efficiency ratings, life is good. 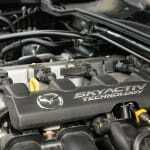 Mazda has long been the flag bearer for driving enthusiasts around the world. Nearly every product they’ve made in the past twenty-five years has featured some sort of nod to fun. 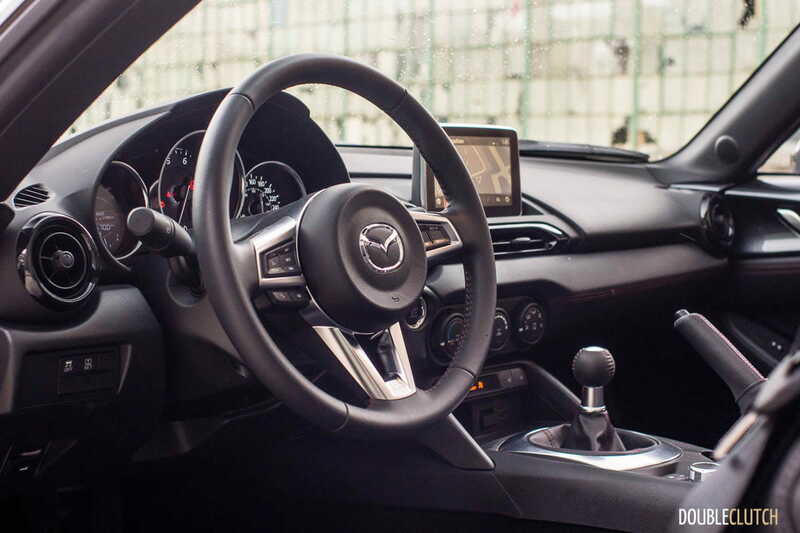 Volume sellers like the Mazda3 (reviewed here) are the benchmarks in their respective classes, to people who are looking for something decent to drive, above all. 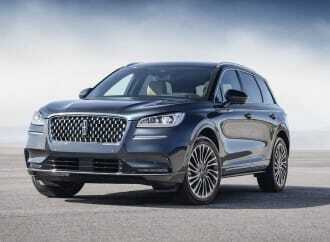 Even their small and medium-sized SUVs give the driver decent steering feel and good response. 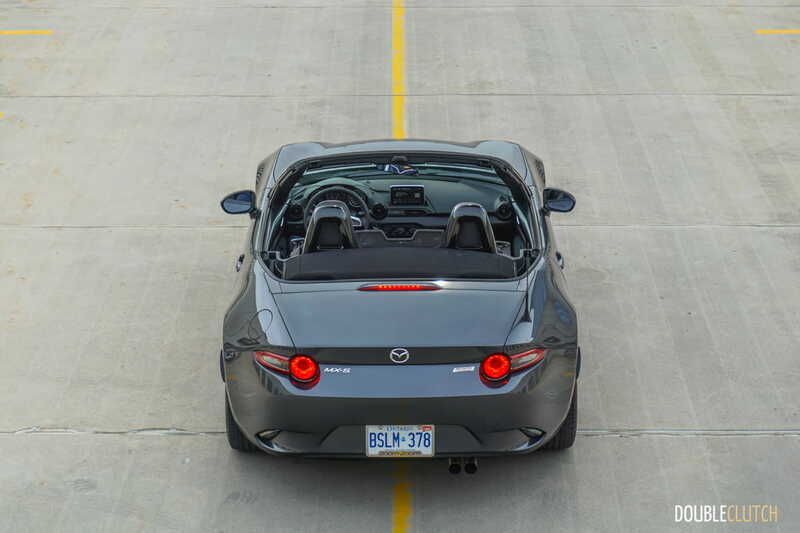 The biggest ambassador to Mazda’s enthusiast-focused SkyActiv engineering philosophy has got to be the MX-5 convertible. 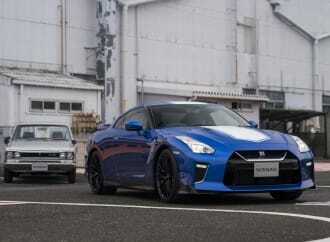 Now in its fourth generation, it really needs no introduction. Dating back to 1989, it has delivered millions of kilometres of simple, top-down motoring fun. 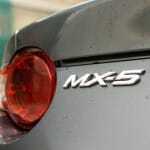 The first-generation “NA” MX-5 was simple to the core, with a short feature-sheet and heavy emphasis on light weight. 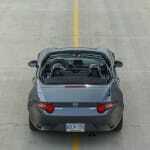 The NB and NC versions that followed continued to follow the simple philosophy of maximizing top-down driving enjoyment. By being so good at this simple – yet difficult – formula, expectations have been very high after the NC replacement was announced. 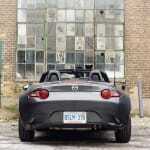 The third-generation NC MX-5 enjoyed a long ten-year run, but owners and enthusiasts wondered about the future. 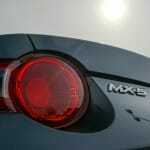 Tightening emissions and safety regulations were bound to affect the way the upcoming MX-5 would look, feel, and drive. Once the weather finally started to warm up in Toronto, I picked up the key to a Meteor Grey Mica 2016 Mazda MX-5 with the Sport Package. 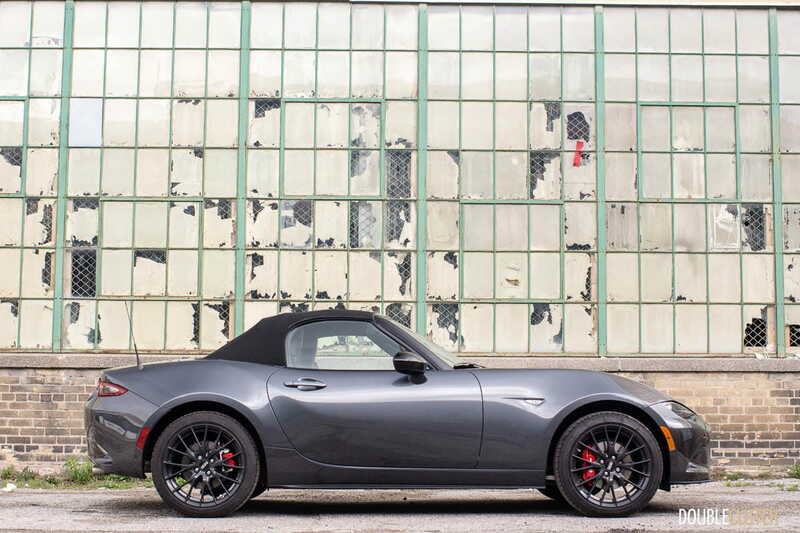 To say the new ND MX-5 (reviewed here) has some big shoes to fill is an understatement. 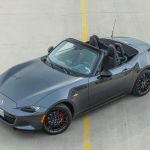 It was one of the most eagerly awaited launches in recent memory, and even though it isn’t Mazda’s top-selling model, the MX-5 can be considered to be one of their flagship “halo” cars – one that carries the brand image. 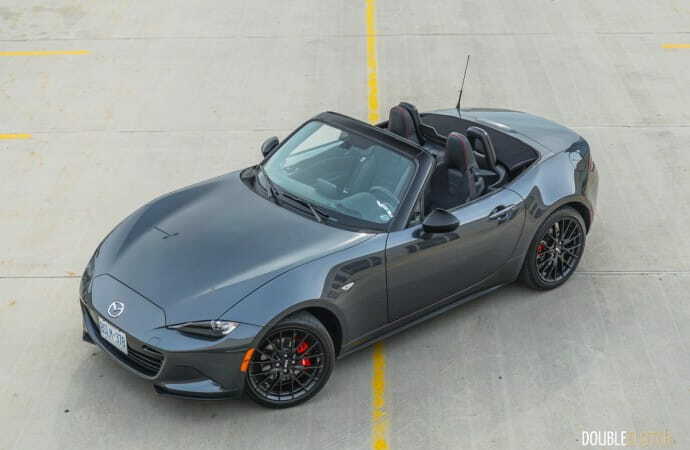 As far as styling goes, it’s a little difficult to stray far from the typical two-seat roadster formula. 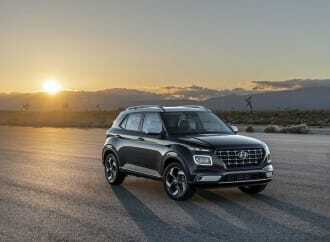 The hood is long, wheels pushed out to the corners, and the front fenders rise up just enough so you can see them from the driver’s seat. 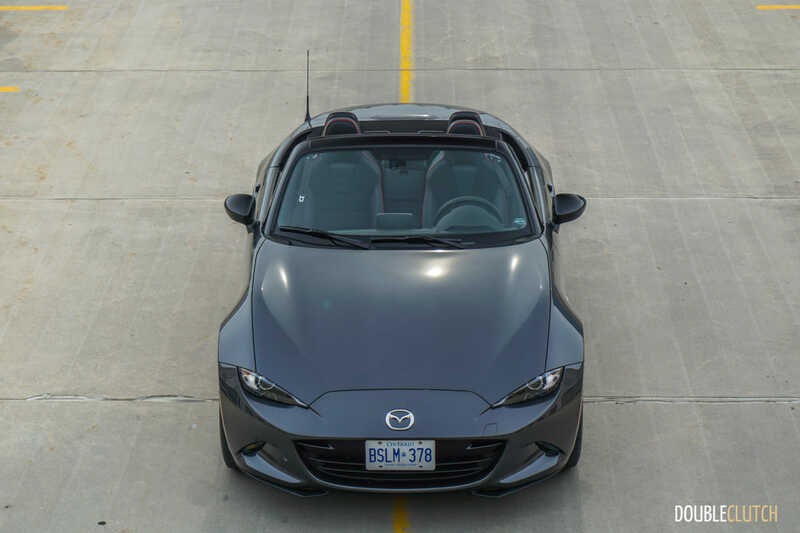 In terms of dimensions, the ND MX-5 bucks the trend and actually ends up being smaller than the original NA MX-5 – how’s that for progress? 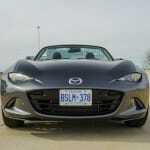 Gone is the big smiley face seen on several different Mazda models, and in is more serious, grown-up look. 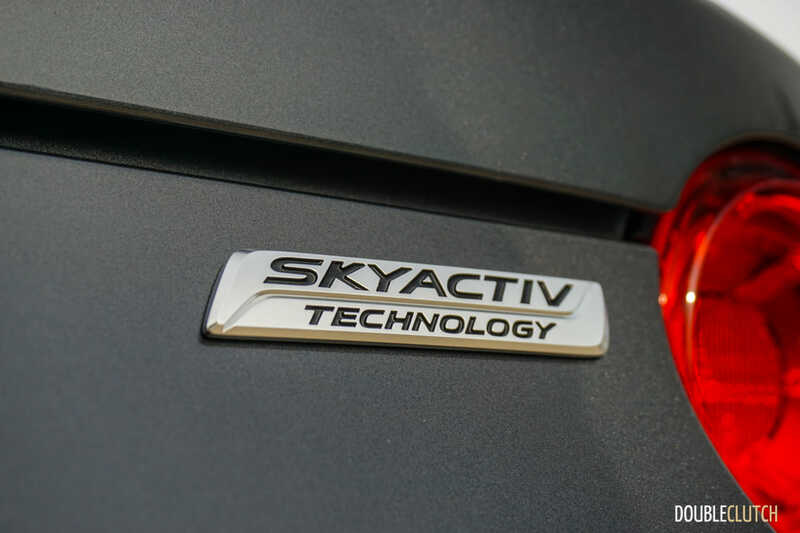 Scowling LED headlights (standard equipment, by the way) flank the new-familiar Mazda five-point grille, and LED daytime running lights live where the fog lights traditionally do. It’s a good look, and it really works for 2016. 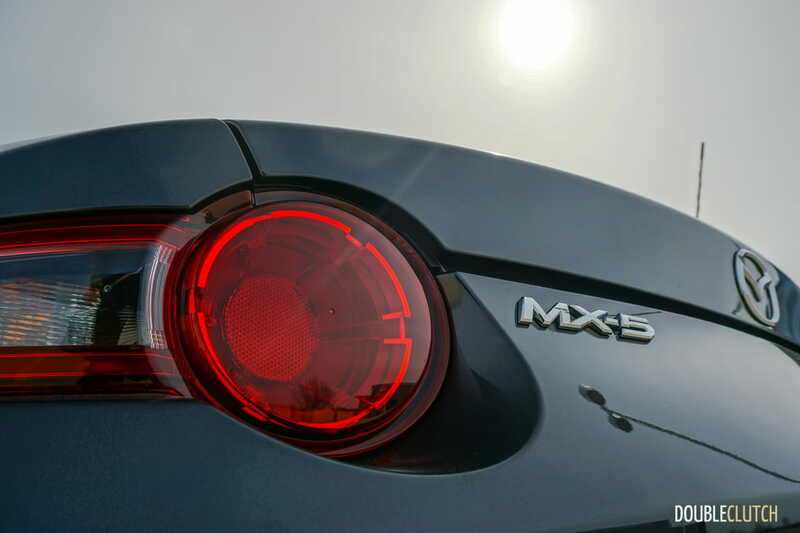 Organic curves gently flow along the side of the MX-5 without appearing too busy towards a stubby rear-end, and a short trunk lid sits on top of an equally-short rear overhang with LED taillights. 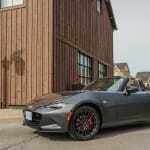 Previous-generation MX-5s were accused of looking a little too cute, and the term “hairdresser’s car” was often thrown around, much to the chagrin of owners. 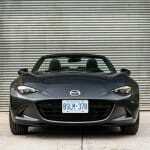 The ND MX-5 doesn’t quite fit that same (somewhat derogatory) stereotype. 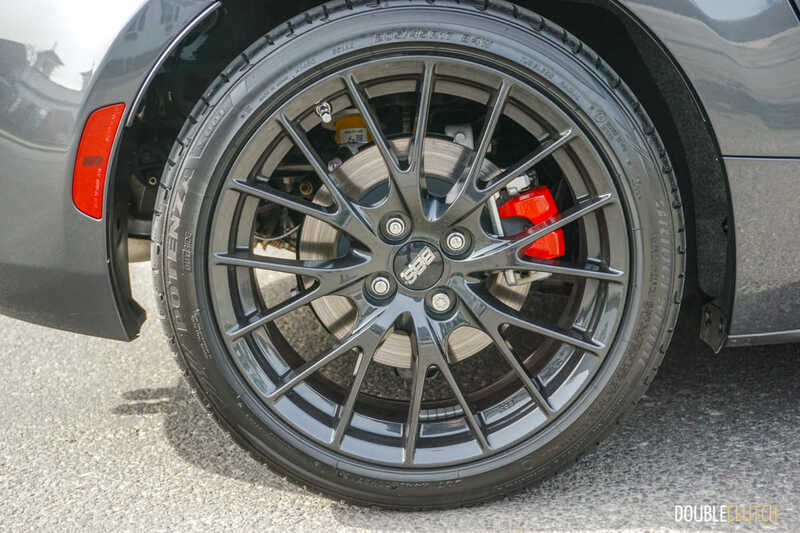 The Sport package adds some cosmetic upgrades, namely the gorgeous forged 17-inch wheels, built by BBS, as well as some excellent fixed-piston front brakes, sourced from Brembo. 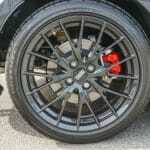 Wrapped around those wheels are 205-section summer-only tires. 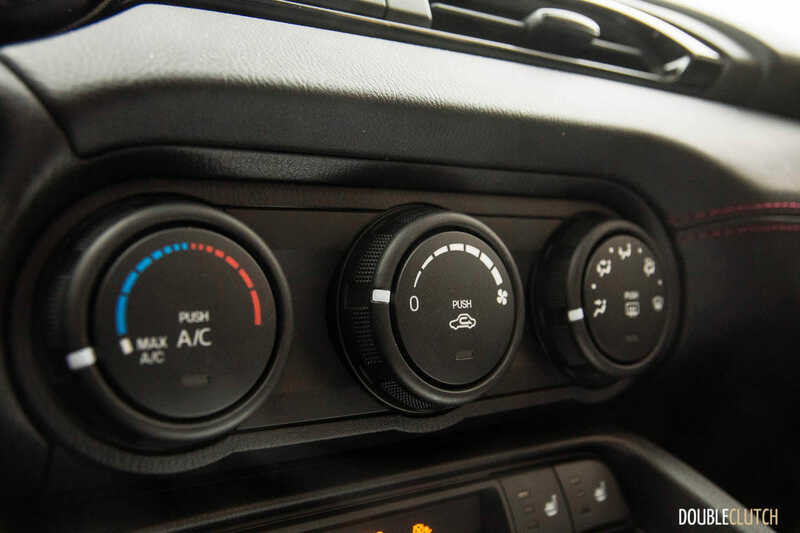 Combined with the Bilstein dampers (standard on the mid-range GS and up), you’ve got some serious hardware that is more than up to the task. 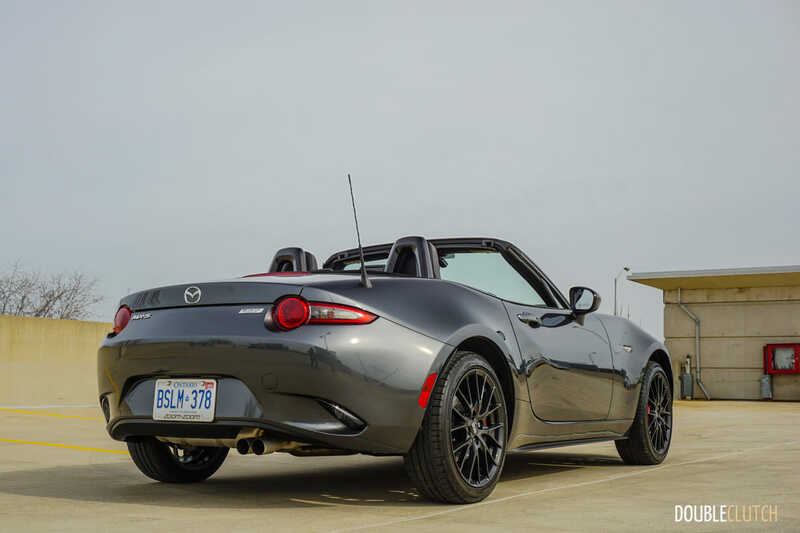 All this added hardware surprisingly doesn’t contribute to any weight gain in the ND MX-5. 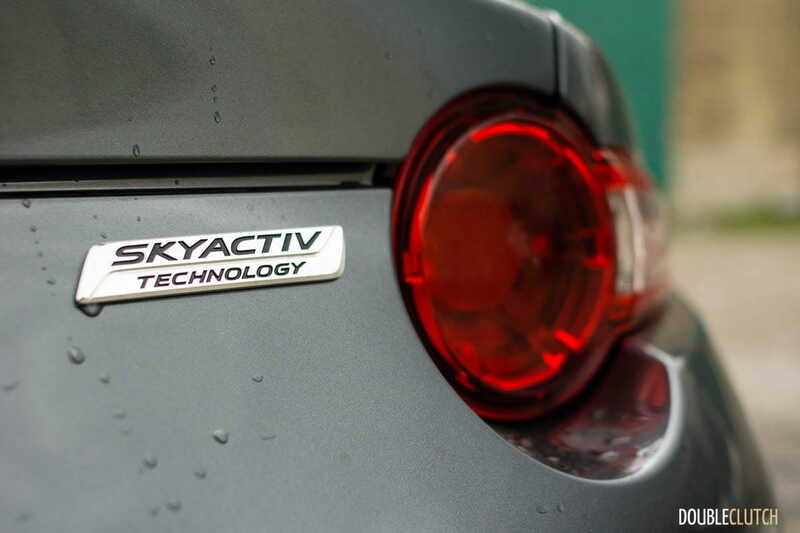 The ND MX-5 is actually about 100kg lighter than the NC, thanks to Mazda’s smarter SkyActiv engineering. Smaller dimensions, better packaging, and improved metallurgy all come together to produce a net loss in weight. 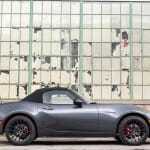 Considering that the MX-5 meets all of today’s safety regulations, the reduced weight is really great to see. Providing motivation for the ND MX-5 is a new naturally-aspirated SkyActiv-G gasoline engine, displacing 2.0L, and features direct-injection, a sky-high 13.0:1 compression ratio, and some exotic exhaust plumbing, it puts down 155hp at 6000rpm and 148-lb of torque at 4600rpm. 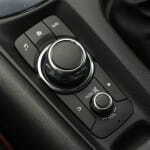 Power is sent to the rear wheels by way of an excellent six-speed manual transmission. 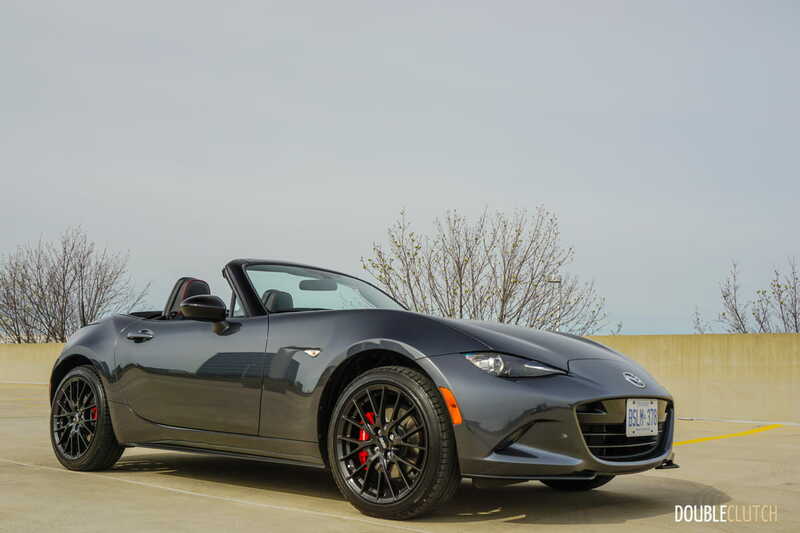 While the ND MX-5 is unlikely to set any drag racing records, the reduced weight and improved technologies allows for better performance on and off the track. 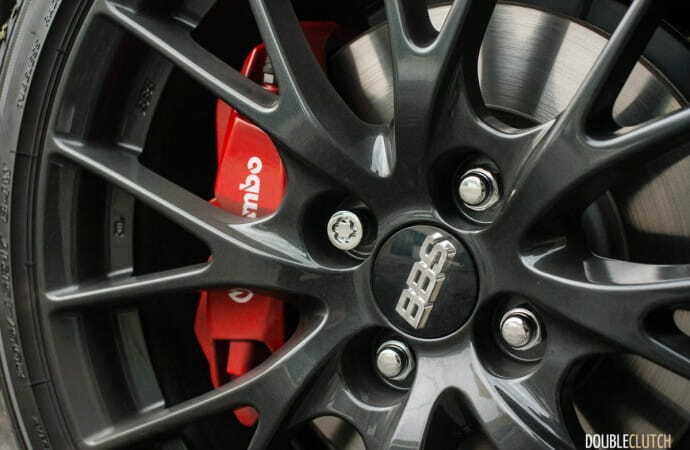 A limited-slip differential is standard in the mid-range GS and top-end GT, and is definitely worth the upgrade. 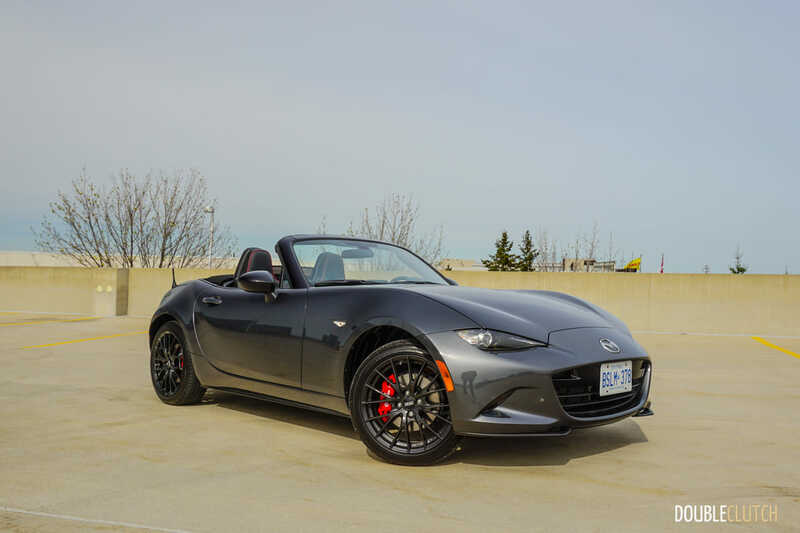 For those who like to look at figures and specifications, the Mazda MX-5 doesn’t really seem like an obvious choice for the enthusiast. It’s not about the numbers, but rather how it makes the driver feel. 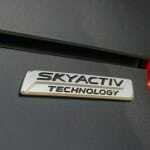 The driving position is low, and purposeful, though the driver’s seat isn’t as adjustable as one would expect. 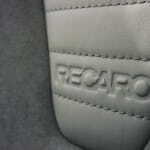 The seat bottom only tilts up and down at the front-end, instead of the whole seat moving up. 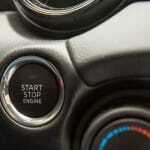 Taller drivers should sit behind the wheel as a very first step. 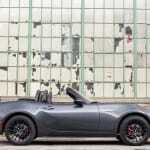 If you don’t fit into the MX-5, there’s not a whole lot one can do to fix things. 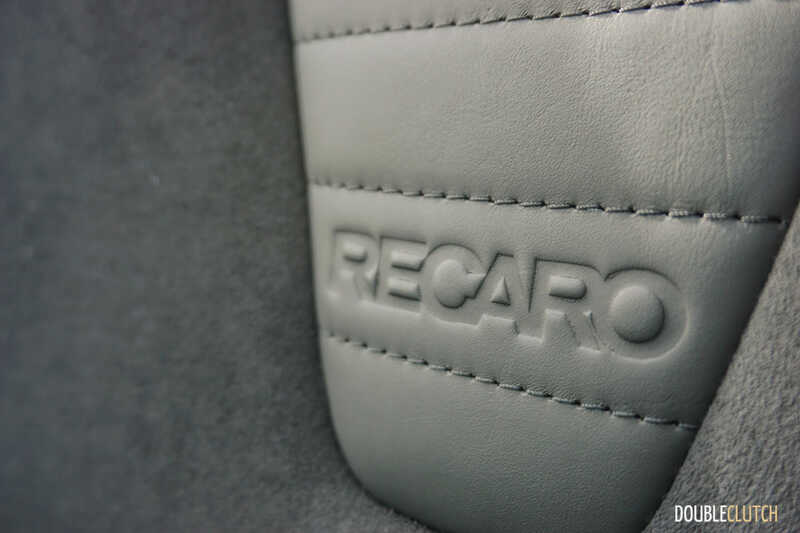 The Recaro seats of the Sport package further complicate things, with more aggressive bolstering and what feels like a very slightly higher driving position. 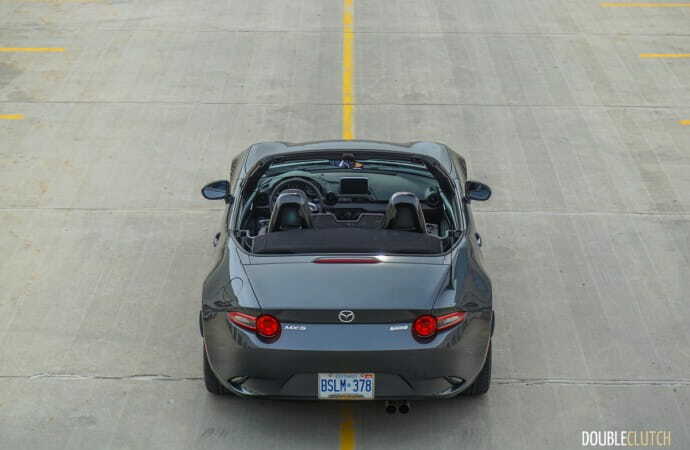 For what it’s worth, I fit into the MX-5 perfectly. Fun facts: there’s one 12V outlet, but it’s buried well within the passenger footwell. 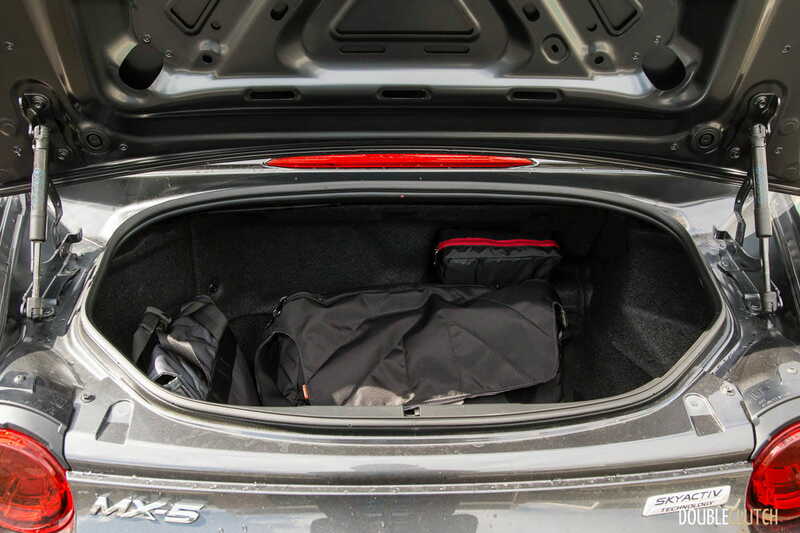 The trunk is also decently deep – you’re not going to be clearing out your Swedish flat-pack furniture store, but it’s more than enough for day-to-day use. 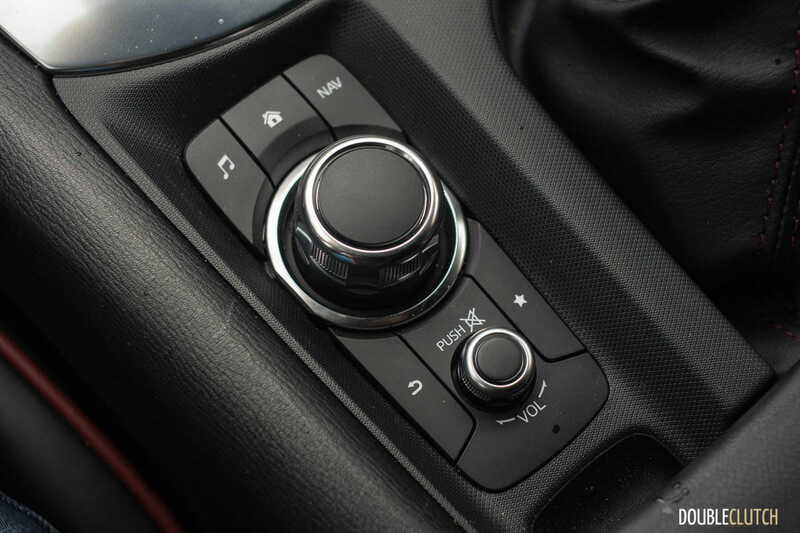 Other than the thick-rimmed steering wheel, the next most important item that makes up the driver’s interface is the gear shifter and clutch combo. 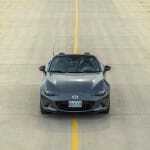 The MX-5 is another example of Mazda’s expertise in making an easy-to-drive cars with three pedals. It’s super-easy to launch the car with no throttle, and the revs build and fall quickly, so good footwork is key here. The shifter isn’t connected to the transmission with cables or even steel rods – the direct linkage delivers amazing feedback to the driver with precise and short shift throws. 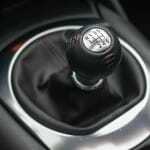 It’s easily one of the best shifters around, at any price. 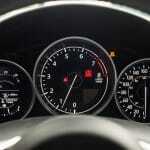 Luckily for you, the overall gearing is quite short, so you could very well hit sixth gear by 60km/h. 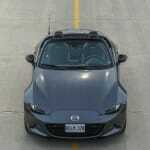 One of the big discussion points behind the ND MX-5 is the electrically-assisted power steering. 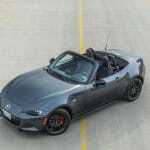 The previous-generation NC MX-5 was one of the last hold-outs that still featured hydraulic power steering. It was especially good, delivering the feedback we’ve all come to love. 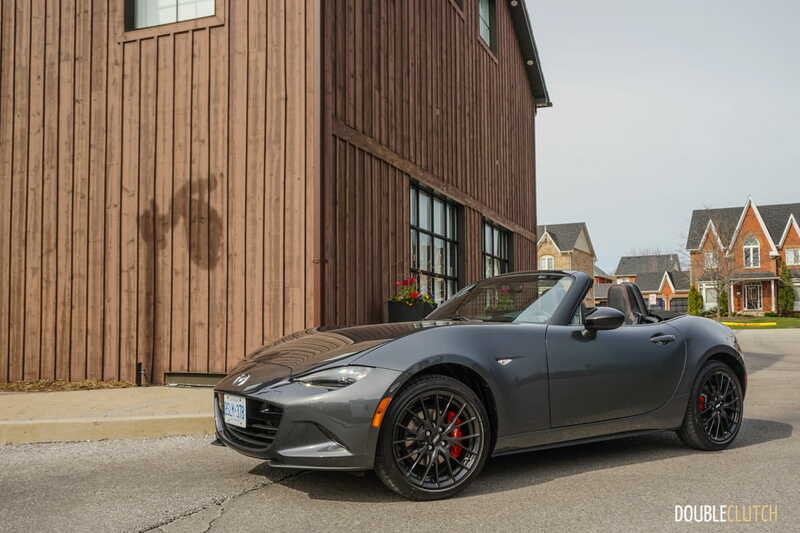 In today’s never-ending pursuit for fuel efficiency, electric power steering is now the default choice, and the new ND MX-5 is no exception. 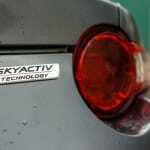 In this case, Mazda has done a pretty good job with weighting, but feedback is just a little muted. Put it this way: if electric power steering systems started here years ago, I don’t think enthusiasts would have much to complain about. 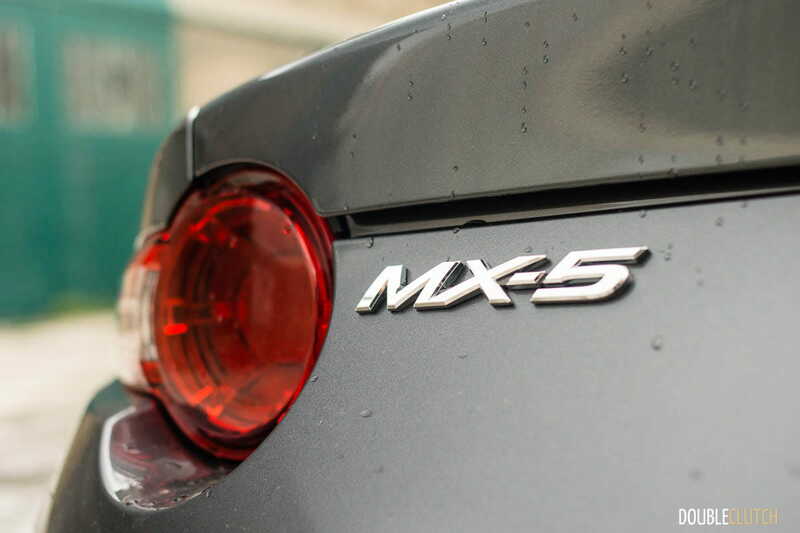 The MX-5 proves to be superbly balanced at speed. Going down a curvy road gives you a lot of confidence to just throw the car exactly where you want it. 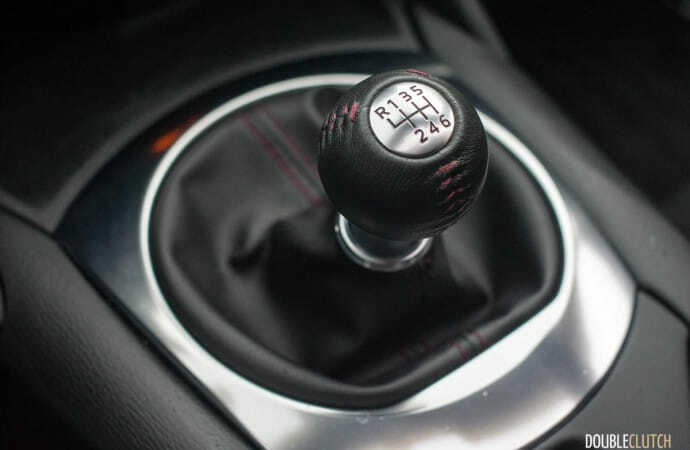 It’s easy to place it either within a narrow lane, or to perfectly hit that corner apex – right out of the box. Some other journalists have mentioned the excessive body roll under heavy lateral load. The roll is certainly there, but I don’t think it’s a bad thing. 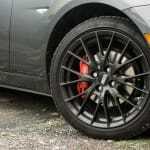 The grip from the summer tires doesn’t give up, yet the understeer and oversteer that builds is friendly and easy to correct with either more or less throttle. 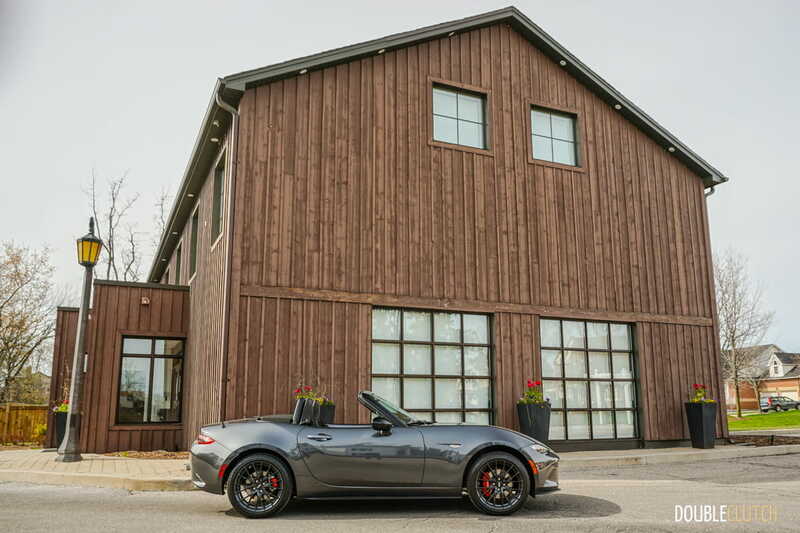 It’s the slightly soft suspension that gives the MX-5 a wonderful suppleness that allows it to soak up larger road imperfections without punishing the occupants. The top-down motoring experience is the other big deal with the MX-5. 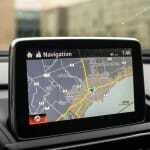 The “gram strategy” sees engineers try to reduce weight as much as possible in smart ways. 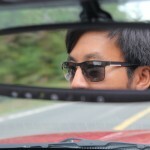 One of those ways is to reduce the weight of the soft top itself. 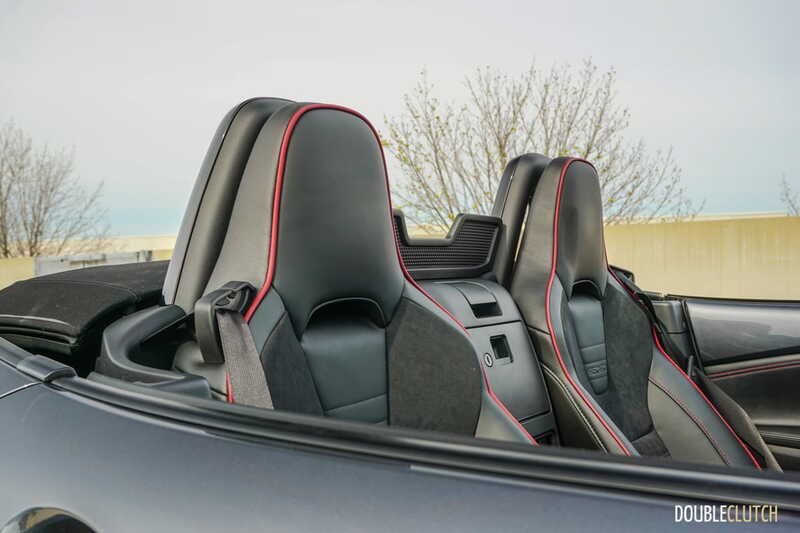 Many other soft-top convertibles require two hands (or even two people) to lift the top from its stowed position. 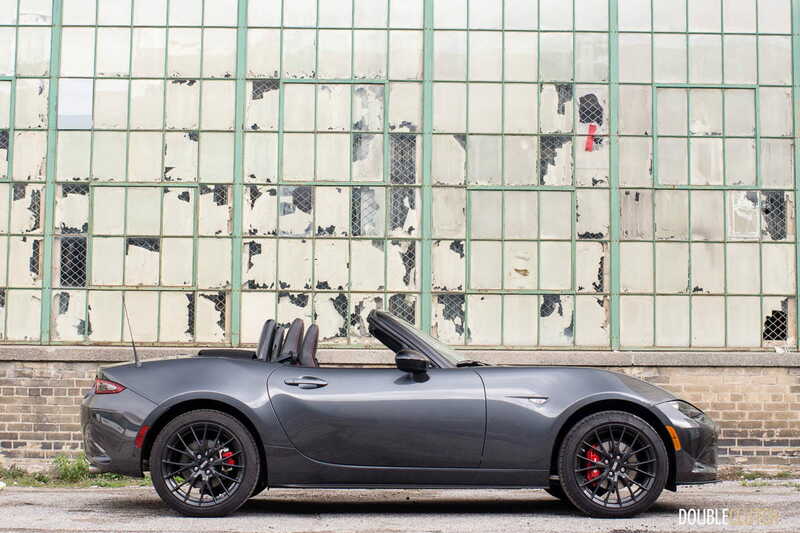 The MX-5 makes everything so easy – dropping and lifting the top is a one-handed affair. 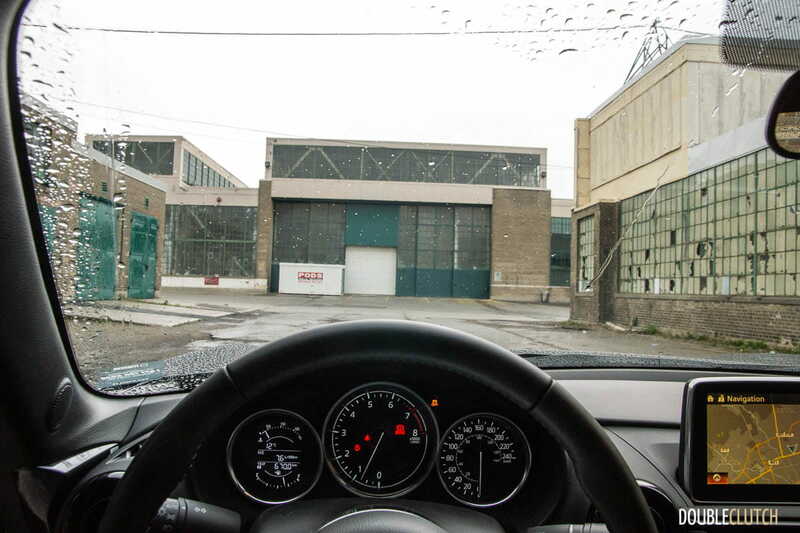 It’s especially impressive considering the soft-top still manages to integrate a heated rear glass window. 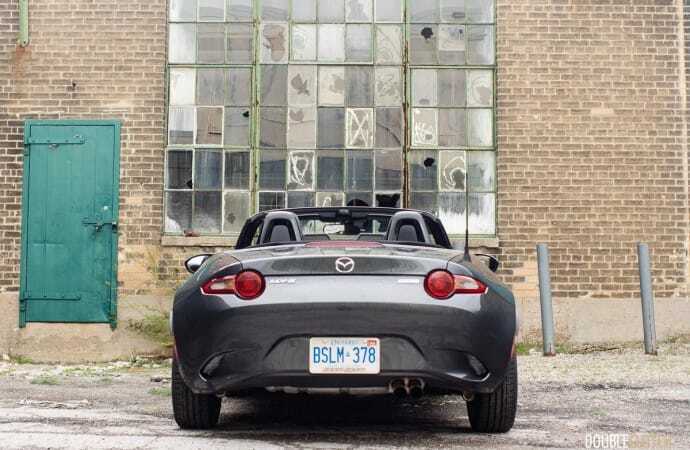 The original first-generation NA MX-5 featured a plastic window that needed to be unzipped before you could drop the top. 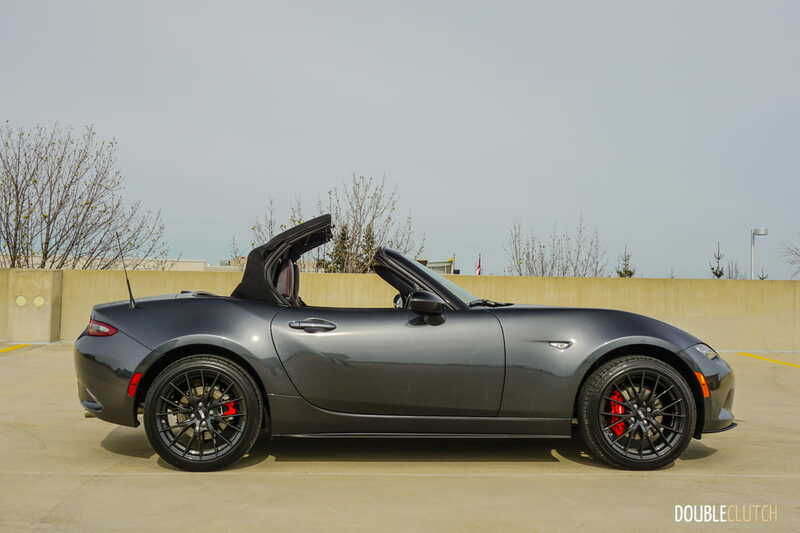 More soft-top convertibles need to be like this. 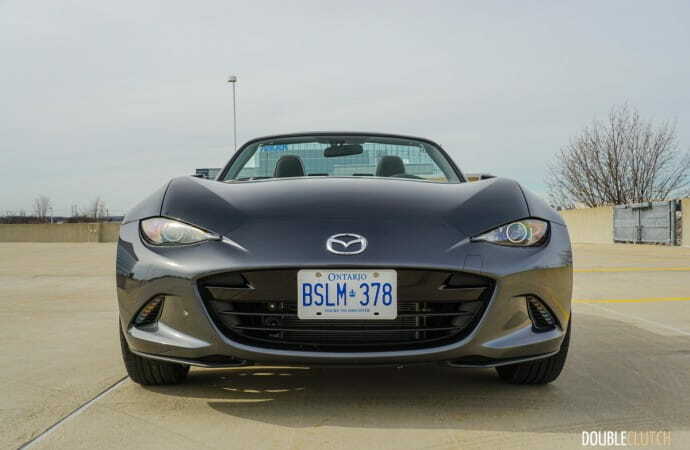 There’s nothing quite like enjoying the spring sunshine with the top down. 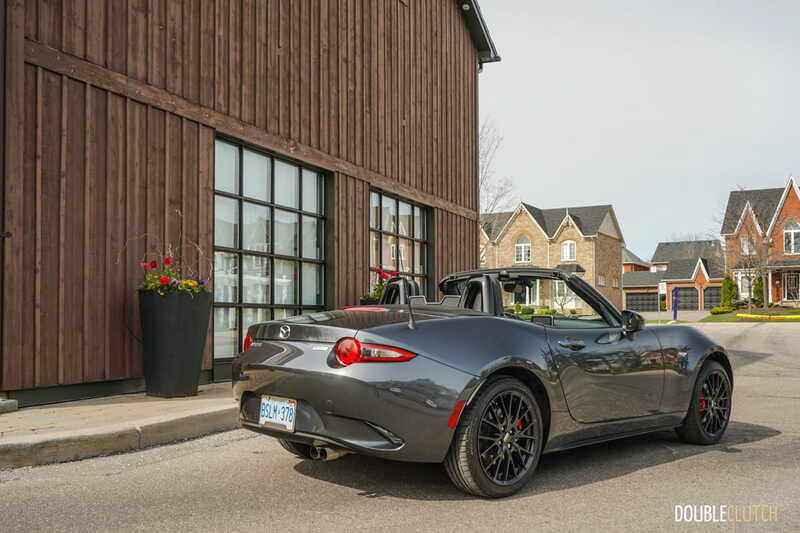 The reduced weight of the MX-5 leads to so many benefits. We’ve already covered how it improves every single aspect of driving dynamics, but it really does pay dividends to real-world efficiency. Mazda rates the MX-5 GS at 8.8L/100km in the city and 6.9L/100km on the highway. Over a week of about 800km of mixed city and highway driving, I ended up with an indicated average of 7.6L/100km. The tank will accept 45L of premium fuel. 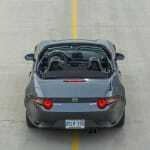 The Mazda MX-5 starts at $31,900 for the base GX with the manual transmission. 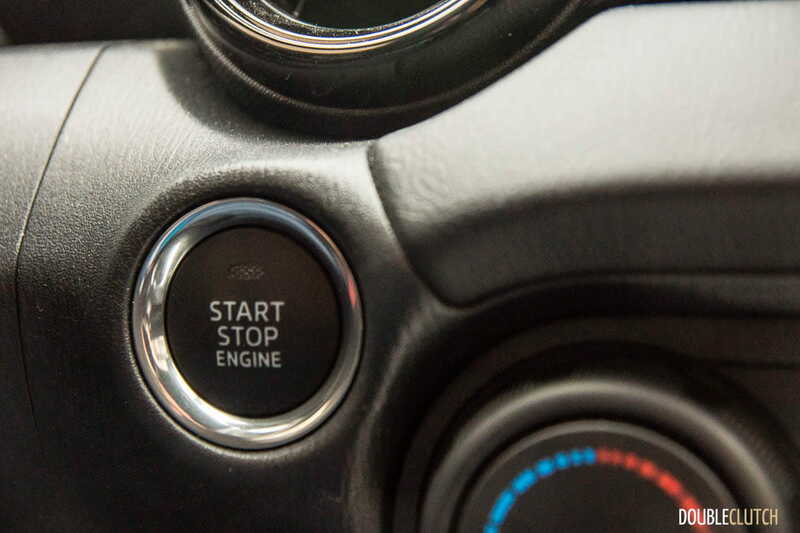 The list of standard equipment is pretty decent: LED low-beam headlights, power windows and locks, Bluetooth, air conditioning, and push-button start, among other things. 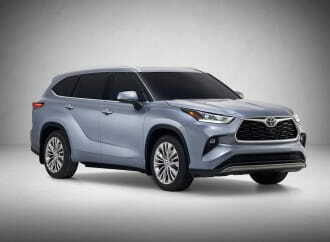 The next step up is the GS at $35,300, which adds larger 17-inch wheels, and in the case of manual transmission models: limited-slip differential, additional bracing, and dampers courtesy of Bilstein. 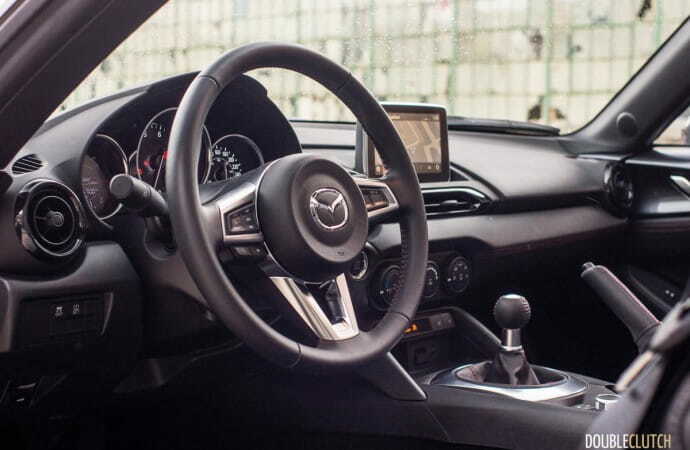 Inside the GS, there is a larger 7-inch touchscreen with satellite navigation, as well as a leather wrapped steering wheel, shifter, and parking brake handle. 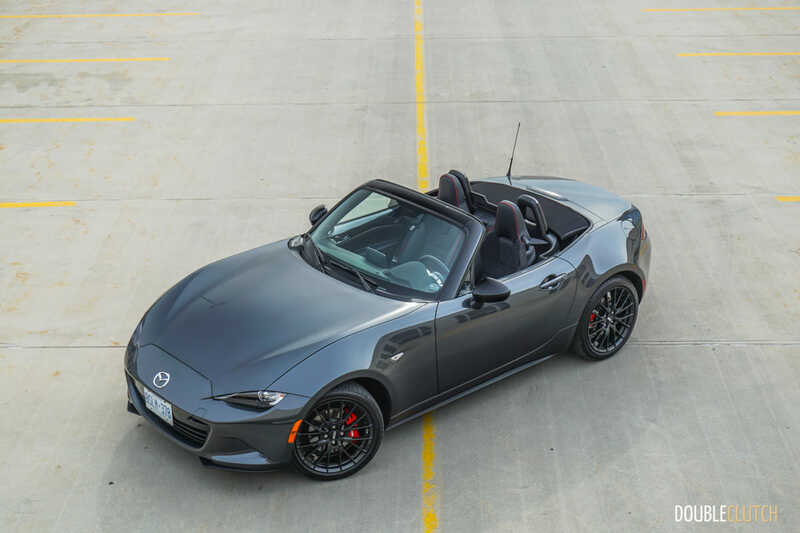 The Sport Package adds $4,400 to the MSRP, bringing the as-tested price of my particular MX-5 tester to $39,700, before additional dealer fees and taxes. 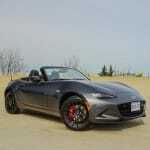 I really do like the BBS wheels for their timeless design, and the Brembo front brakes are definitely track ready (anything with fixed calipers is cool in my books), but the low curb weight of the MX-5 means that the braking system in the non-Sport Package cars won’t be terribly overstressed. 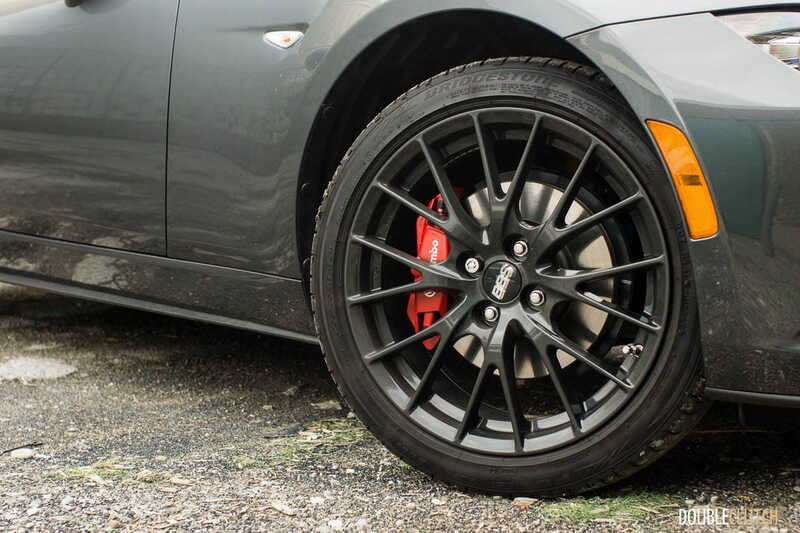 Unless you’re doing some serious track driving where you need all that additional thermal capacity, the standard brakes will very likely do the job, and then some. 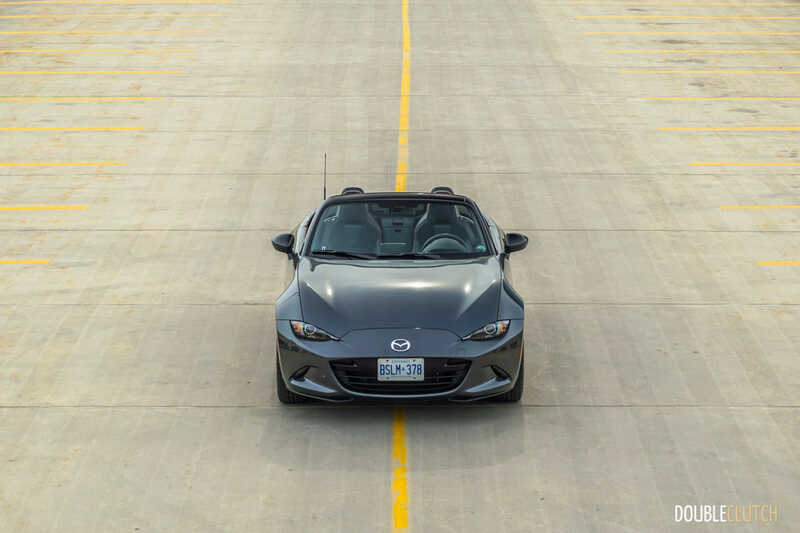 The Mazda MX-5 competes in a sort of class that doesn’t contain many peers. 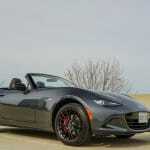 The buzz on the internet lately has to do with the incoming Fiat 124 Spider, which is coincidentally the same car underneath. 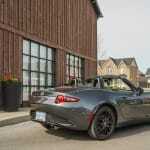 Where it differs is its powertrain: Fiat drops in a turbocharged 1.4L four-cylinder engine, which should give the car a very different character, compared to the MX-5. 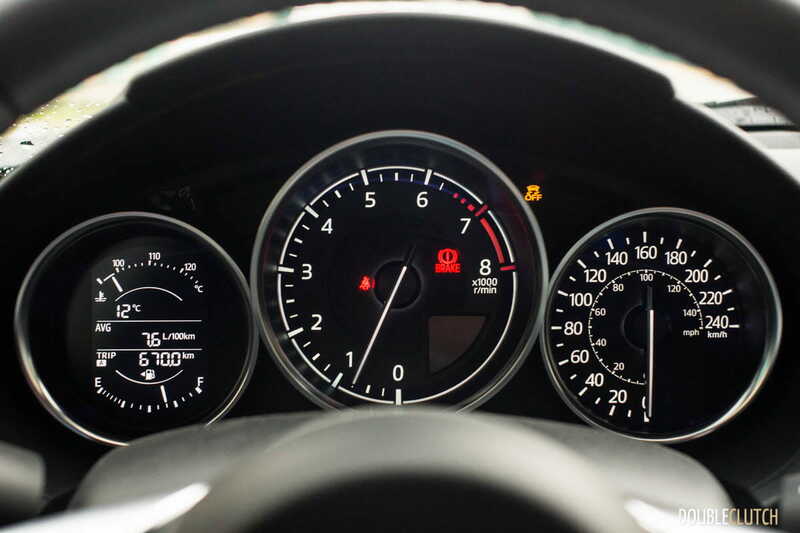 I don’t know how I feel about losing throttle response (turbos generally kill the “right-now” response), and the high-revving nature, but low-end torque should be very nice. 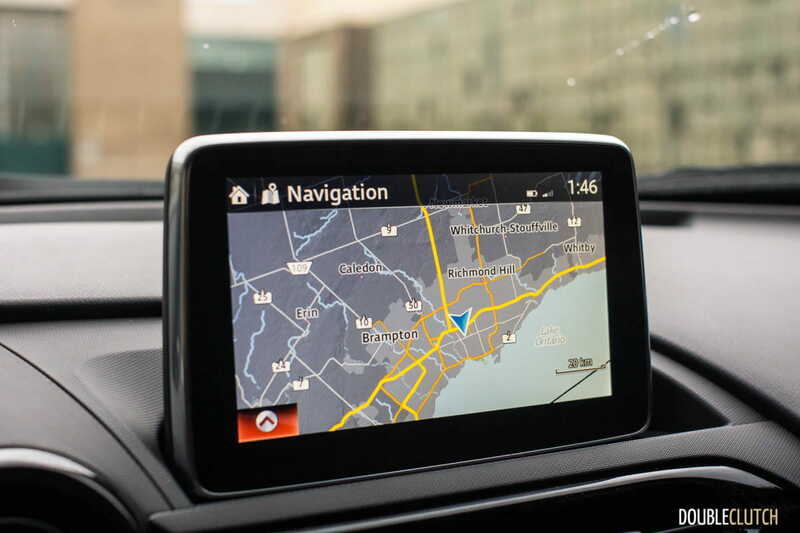 Subaru’s BRZ (reviewed here) and Toyota 86 also caters to a similar enthusiast crowd, but comes in at a more affordable asking price. 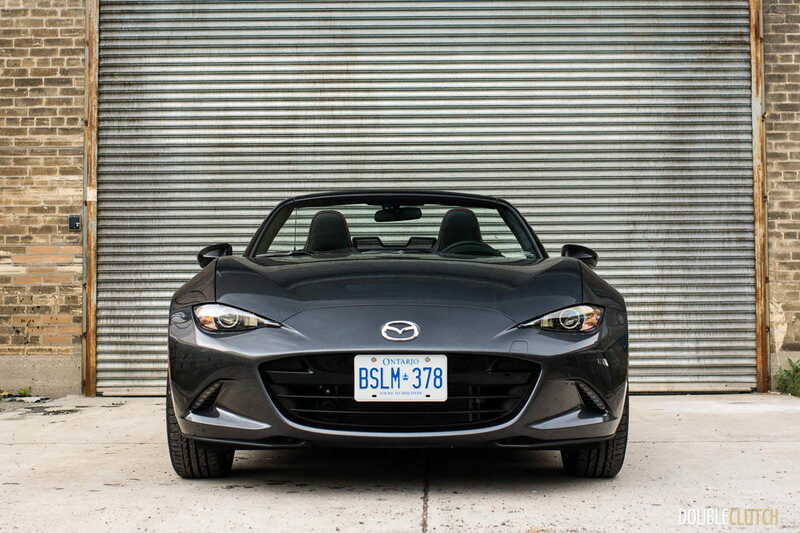 People like to ask whether the price difference between the MX-5 and BRZ/86 is worth it: the short answer is yes. 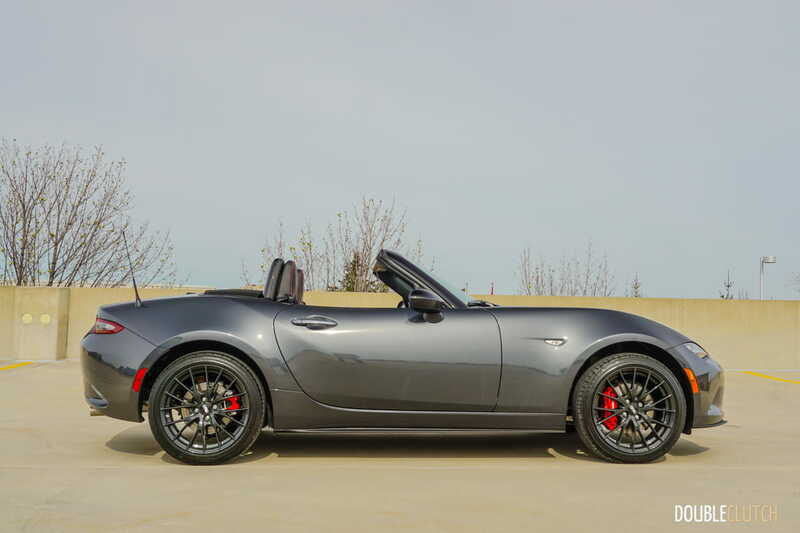 The 2016 Mazda MX-5 Sport Package is my kind of car. It’s small in an oversized world, lightweight in a very overweight economy, and it is easily one of the best enthusiast cars available at any price. Most cars have gotten so good nowadays at doing everything for the driver, so it’s supremely refreshing to take in all those analog feels. 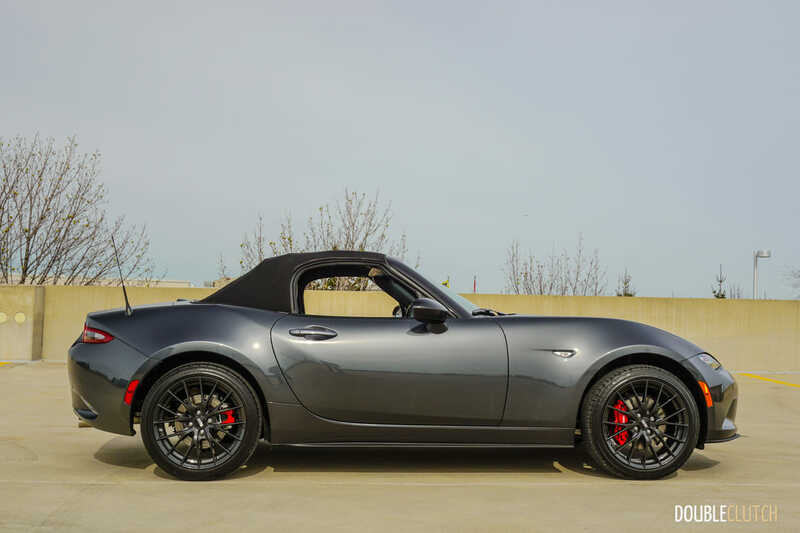 Just like with the previous-generation NC MX-5, I found myself awake at an ungodly hour, itching to go for a drive. I can’t think of a better car to drive around the empty streets of Toronto at 4am.